This outfit started out different. The scarf was on my head, I had a giant necklace, and red lipstick. And then, somehow, that wasn't working and the scarf became a little bow tie. It wasn't really cool enough for this kind of thing. Morning and evenings are chilly, but during the day in the sun it's still just a bit too much. Lately, I've been getting away from dresses and skirts. Even away from vintage! Not for good mind, just for the moment. I'm distracted by all the new fall things set up everywhere, and most of my favorite vintage spots seem to be running dry for the moment. This happened last year too. Suddenly we hit autumn and I wanted nothing more than pants and funny vests. Less delicate and frilly! Oh man, I've been feeling the same way clothing wise!! It must be the fall! p.s. im going to have to ask you to show me how to make large images on blogger, because i just cannot figure it out! i love this look. i'm definitely going to try recreate it once it gets a little cooler around here. I really like this look on you. I haven't seen many people wear vests lately, but I think they're making a comeback! I loooooove your shoes too!!!! 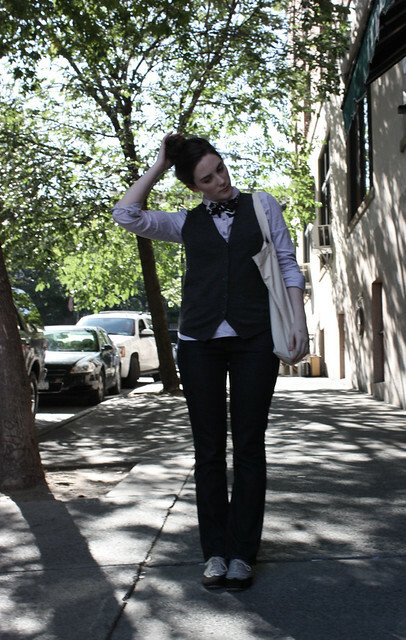 Oh my gosh, I absolutely love this outfit, I really want to find a good vest! Menswear is so amazing! This is really perfect for fall. I think there's something about cooler weather that really makes me want to wear pants, especially as I hardly ever wear them in the summer. I love how outfits sometimes mutate as you leave the house. I love this look on you! So inspiring, I am going to go get me some vests!! love this boyish look! you look so lovely in it and I like that idea with scarf! Love the boyish look. Very cute and I love your shoes. so lovely, especially the shoes & bow tie! derpy??? you still look adorable. and thank you for giving much needed inspiration on how to wear my vest i got a couple of years ago and have only worn ONCE! I think I should share with you some lovely things that you may like. First, I think you should listen to Linda Perhacs with her album Parallelograms. Then, you should see the movie "Atonement". When I heard this music and saw this movie, it reminded me of you. I hope it will be a nice surprise for you ! I love this. 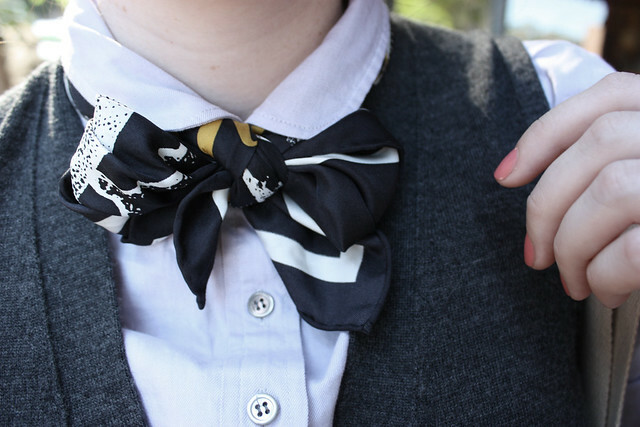 That little bow tie is such a cute way to wear a scarf. Thanks for the fall inspiration! love this look, your little bow is so cute! 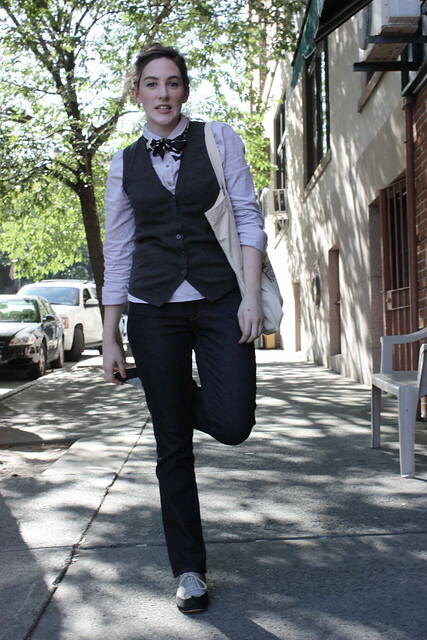 Suuuuuuuper super cute :) I love the boyish touches, but how you work them with a darling femininity! 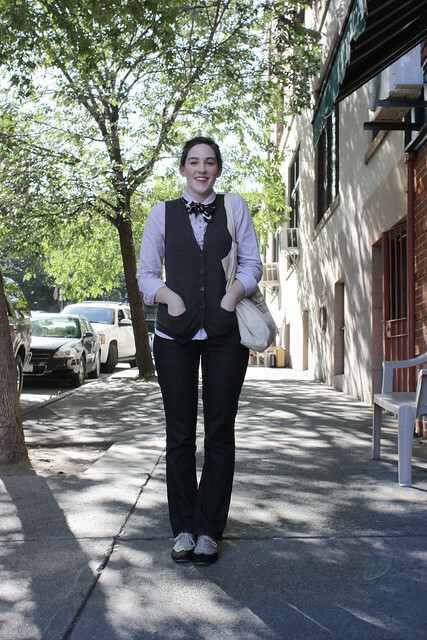 Good choice on the bow-tie version of your scarf...totally makes the outfit. I really like this, actually. That's strange because I'm used to like the vintage frilly things you describe, but this looks really good (and comfortable!). I totally get you, I'm digging the no fuss, minimalist androgynous look for fall too and this totally works on you! Love the shoes! Thank you so much for the delightful comment!! I really can't remember, for some reason, whether or not I commented on this post already, but I had meant to say something when I saw it yesterday!! I really love the look you did, and even shared it on my FB wall w/ a link to your blog. I love this look, especially the little bow tie! Your nail polish is fantastic! Do you have the colour name (I've been looking for a similar shade for EVER)? eeep! I love this outfit! Im kind of on an Annie Hall kick right now so I love it! I love this outfit so much, it even makes me want to give pants another go. And if that is you looking derpy, that is just depressing! I love, love, love those shoes and it's so nice to see Albany in the background. Lark Street? I just moved away and miss it dearly. Lovely outfit, as always. nos encanta tu estilo vintage! pasate y siguenos si te gusta! I love this outfit! It looks perfect on you. And i love outakes! i love this outfit! we seem to be on the same wavelength pants-wise! i've been craving them too. along with icecream...weird! i've been reading you blog for ages (i used to have my own blog too) and have just started up a new one of my own. i've currently got a questionaire on for my university course, i was wondering if you might be able to fill it out, if you have the time? it's not very long! it can be found at http://girlandbird.weebly.com/blog.html. i would be so grateful if you could! incredibly darling. I love this look. You pull it off perfectly. It's really perfect for fall. I think there is something cooler than I really feel like wearing pants, especially because I never put them in the summer. In all these there are so many things which is really great. love the menswear look! also love the scarf-bow on your head from an earlier post. A scarf bow tie! We're so trying that tomorrow.